"Here's The Ultimate Lazy Way To Promote Your Business, Drive Targeted Traffic To Your Sites And Even Generate Lucrative Backend Profits... Automatically!" Do you sell or give away ebooks or software that you didn't create yourself? I know that I do it myself on a regular basis. Using other peoples' resale rights products offers a quick and easy way to provide gifts to your list, add bonuses to your offers, or even just make a few extra quick bucks. It's a great way to make sales - but have you ever stopped to think just how much money other people are making from your customers as a result? I'm talking about backend sales here - sales through affiliate links and adverts embedded inside these products. Odds are that many of your customers will respond to these links and adverts - but right now you're missing out on all the action! 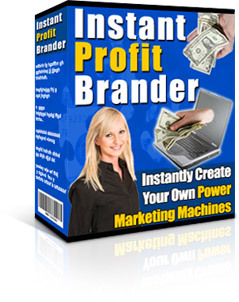 Instant Profit Brander is an easy to use software tool that allows you to take your slice of the valuable backend benefits generated by other people's products. Benefits like name branding, targeted traffic to your sites and free advertising. In a nutshell, Instant Profit Brander makes sure that your customers see your adverts name and links, as well as those of other people. It achieves this by wrapping one or more of these products inside a "wrapper", forming a package branded with your details. After using Instant Profit Brander, your customers will see your name, your adverts and your links every single time they use any of the products in the package. To start with, you place the ebooks, software or other files you want to distribute into a folder on your PC. You can include a single item, a set of items (for example a main product and a set of bonuses) or up to ninety individual items, to create a complete package. Now just run the software and enter your branding details - then click the "Create" button. In seconds, your ready to distribute, fully branded package is automatically generated. The software even remembers all your branding details automatically, so next time you want to create a package, you can generate it with literally just four mouse-clicks. Building your own profit generating packages doesn't get any easier than this! The packages generated by Instant Profit Brander are Windows executable files (.exe files). To use one of these packages, your customers simply activate the .exe file by double-clicking on it, in the same way as they would activate any software tool. You'll immediately notice the eye-catching branding at the top. Your packages will feature your name and site link in this space, along with a short text advert for your site. Not only will this encourage customers to return to your site, but it will also help build name recognition, a valuable way of ensuring future sales. Underneath this eye catching branding, you'll see a drop-down list of items in the package. To use any of these items, your customer will simply select the item he or she wants and then click the "Activate" button. The selected ebook or software will then run automatically. For example, if the customer wanted to read the "10 Easy Steps To A Profitable Business Ebook", he or she would just highlight that option and click "Activate". The ebook would then open immediately, ready for use. You'll notice one very important thing about this system. Your users actually access the individual ebooks or software tools from inside your package every time they want to access them. They can extract the individual items if they wish using the "Extract" checkbox (unless you disable this option), but most users will not bother to extract the items. After all, if you've packaged together a group of related items, it's much easier for customers to keep track of them all if they are all packaged up together. This of course means that your customers don't just see your name, link and adverts once. They will see them every single time they use any of the ebooks or software, at any time in the future. As well as the eye catching branding at the top, you've no doubt already noticed the advert at the bottom of the screenshot above. In fact, it's rather difficult to miss it with its high impact text and the nice, attractive graphic in the middle. Every package you create with Instant Profit Brander will feature an advert just like this, with your text and image. You can advertise anything you want. Your own products or services, an affiliate program, or anything else. To use this powerful feature, you simply type in the text you want for the advert heading and body - and it will be formatted for you automatically. Alternatively, you can enter full HTML (using any HTML features) to create just about any layout or design that you want. As you can see, you can generate very eye catching adverts with this system. In fact with all this flexibility, you are only limited by your own imagination. Viral Marketing is one of the most effective ways to promote an online business. You simply create a product or package featuring your adverts and links and then let other people sell it or give it away. As the product or package spreads from person to person, so do your adverts and links. 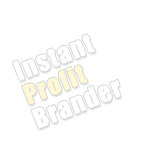 Now with your copy of Instant Profit Brander, creating viral packages is a cinch. As your branded packages are passed from person to person, your name, links and adverts will be passed inside, generating a laser targeted traffic stream directly to your websites. To make use of this software, you'll need products with Master Resale Rights that you can include in your packages. To get you started, I've put together a collection of 25 in-demand niche products, covering a wide range of market areas. You can use these to create packages for people involved in lots of different niche marketing sectors - and for people involved in selling Resale Rights products. Each one of these products carries Full Master Resale Rights and permission for you to include them inside your own packages. If you bought all 25 of these valuable products separately, you would pay well over $300. However if you order a copy of Instant Profit Brander right now, you'll receive this entire collection completely free. Of course you're not limited to just using these products with Instant Profit Brander. You can use any products you want inside your packages (as long as the license permits them to be included in a package) - and create a package on just about any subject matter you want. With the huge and ever-growing quantity of resale rights products readily available on the Internet, your copy of Instant Profit Brander allows you to create a virtually limitless number of power viral marketing machines, generating your own continuous stream of new business. Shows your name prominently on every package, boosting your name recognition, increasing customer's trust in you and encouraging repeat sales. Shows your site link and mini text advert on every package, bringing laser targeted traffic to your website. Shows your high impact, full color advert prominently on every package, allowing you to promote anything you want, to generate lucrative backend profits. Provides an easy way to tap into the power of viral marketing, by instantly creating fully branded packages that can be passed around by others. Includes a very valuable bonus collection of 25 niche products which you can instantly use to create your own packages. With all these benefits made so easily available to you, you could easily expect to pay hundreds of dollars for quality software like this. However I know how hard it can be to build a successful business and I want to help as many people as possible to build a substantial income through this amazing software. That's why I'm currently offering you the chance to get your hands on this software right now for the bargain price of just $47. All this means you can take a full 30 days to check out all this great software for yourself, with no risk whatsoever. I really do expect a lot of demand for this superb software, so this low price could increase at any time without notice. You'll receive instant access to your software, even if it's 2 am in the morning. Totally secure payment is through Paypal, AlertPay or Credit Cards through 2CheckOut. Requirements: This software is for use on PCs running Microsoft Windows. The packages created by this software will also only work on PCs running Microsoft Windows. Earnings Disclaimer: Although the use of this software allows you to easily brand almost any package of products with your own name, link and adverts, the resulting profits are dependent on many factors outside our control, including the effectiveness of you adverts, the quality of the products being packaged and the number of people who download your package. We are not therefore able to give any guarantees about the level of income that you will attain by using this software. We will however happily refund your money in full in the unlikely event that you are unhappy with your purchase.